Tour trough Cuban traditional villages and take a look at life outside the tourism industry and where the green landscapes and fields show us the other face of Cuba. Travel by car trough highway and roads to the city of Cienfuegos where you have free time to explore the historic center and the boulevard of the city. Road to the mountains with several possible stops to take pictures of the beautiful Cuban landscapes, the highest point well reach is at 750 meters above sea level. 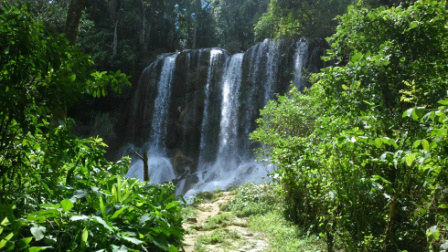 Walk through the path of butterflies approximately 1 km, until you get to one of the most beautiful waterfalls in Cuba, experience swimming in natural pools of crystalline water in the middle of the mountains. You can also swim or walk along different parts of the river with wonderful views of the falls. Transport and driver-guide fluent in English or German language. Visit the trail and waterfalls. Comfortable shoes for walking in nature. Minimum 2 people maximum 6. Payment at pick up time at the hotel.